Today I went to ATW for a one day class dubbed “Where there is no doctor”. This was a very interesting day and I learned a lot. It has been fifteen years since I took the mandatory first aid class to get a driver license and even just refreshing the basics felt good. But also a bit more advanced topics where covered. 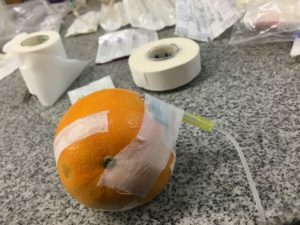 For example this poor little tangerine had to take my amateurish attempts to set a drip infusion, but I did well and it didn’t die ;). There was a lot of information that I have to digest and my travel pharmaceutical list is getting longer and longer. I hope I’ll never use it!